Feel chained to your desk? Having trouble finding time to fit some exercise into the daily routine when stuck in your cubical? Try some of these simple exercises for 20-30 repetitions at your desk to burn some energy, improve posture, and reduce your stress. 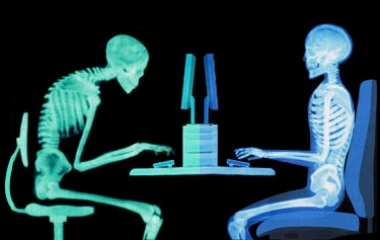 Sitting at Computer Posture Choices – Which would you rather have? Other options, if you have the time, are to take the stairs when possible and go for a brisk walk during a break time or lunch. Remember every little bit of activity each day adds up to improve your health and wellness.